Is Final Cut Pro X for Everyone? Final Cut Pro X is used by professionals around the world. It is especially helpful to those who are on tight deadlines. This is evident with many Final Cut Pro X users in Europe. For example, Norwegian broadcaster VGTV uses Final Cut Pro X exclusively for all of their content. Hangman Studios edits social media videos and tour documentaries for the world's biggest bands in Final Cut Pro X. The editors at Trim Editing use it to cut high end commercials and music videos. Even the team behind the hit TV series La Peste use Final Cut Pro X on a daily basis. To date, Final Cut Pro X has not been widely adopted in Hollywood. Only two major motion pictures have been cut in Final Cut Pro X, Focus and Whiskey Tango Foxtrot. However, TV editor Josh Beal thinks that it is time to reconsider its use for feature films and television. A number of editors in Hollywood have experimented with Final Cut Pro X. The magnetic timeline and organizational tools in Final Cut Pro X can make crafting a story much easier for certain editors. 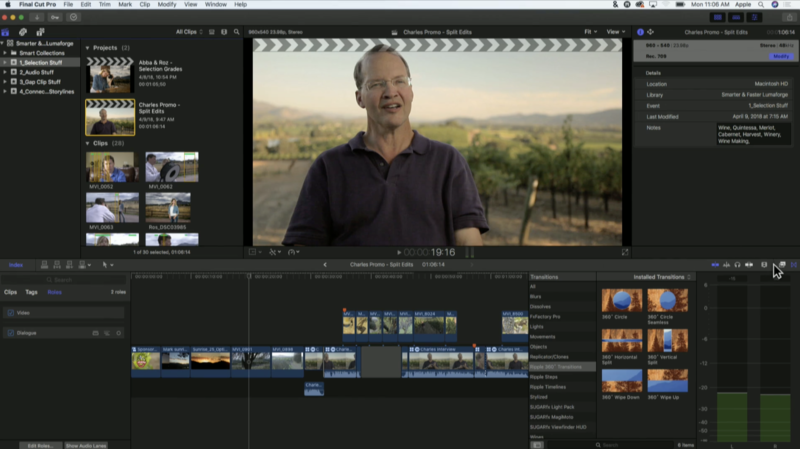 There have been numerous television and feature documentaries cut in Final Cut Pro X. The team at EMS Films used it to cull through 15,000 hours of high resolution footage for a recent wildlife documentary. The team at 1895 Films used Final Cut Pro X for their Emmy award winning documentary Challenger Disaster: Lost Tapes. The keyword tools, along with the Thumbnail View in the Browser make finding the right shot for the right moment much easier for documentary. For the trained editor, moving to Final Cut Pro X can be difficult. Students, on the other hand, come to it quite naturally. Final Cut Pro X is designed to be intuitive. This makes it accessible to students. When filmmaking tools become intuitive, teachers can spend more time teaching students how to tell a story. For a filmmaking class in a box, teachers can combine Final Cut Pro X with iPhones, a few Mac Minis and a LumaForge Jellyfish. In 2018, Apple and LumaForge partnered with Chicago Public Schools to create Chicago Summer Stories. It was a 5 week experience. Students were given iPhones and Filmic Pro. They broke into teams and began shooting documentaries. They edited the iPhone footage in Final Cut Pro X on iMacs and MacBook Pros. Plugging into a LumaForge Jellyfish Mobile allowed the students to share footage across multiple workstations. Why Use Final Cut Pro X? The organizational tools in Final Cut Pro X are very different than in other editing software. Instead of a Project, FCPX has Libraries. Rather than Sequences, it has Projects. Instead of Bins, it has Events, Folders, and Keywords. So why the fundamental changes? Ask someone at Apple, and they will say that the film editing metaphor is no longer useful. The term bin cam from a literal bin on the ground containing strips of film. In an age where most content is captured digitally, this was considered less helpful. In Final Cut Pro X, the same clips can be organized hundreds of different ways. The clip can be placed in an Event. Either part of the clip or the whole clip can be Favorited. Bad takes or shaky footage can be Rejected. Keywords can be applied to a range of the clip. They can also be applied to the entire clip. The Keyword Collections can then be organized into Folders within an Event. Smart Collections can be made to organized footage by different pieces of metadata. There are many 3rd party tools that extend the organizational tools in Final Cut Pro X. Have a Script Supervisor on-set? Shot Notes X can bring their notes in as FCPX metadata. Shooting an interview? Lumberjack System can break down transcripts into Magic Keywords. Lumberjack Builder allows you to make paper cuts from your transcript and bring them straight into FCPX. Working with multiple editors? Combine your Keywords and Ratings using Merge-X. The third party tools can take your Final Cut Pro X organization game to the next level. People either love or hate the Magnetic Timeline in Final Cut Pro X. Tracks are no more. Instead, there is a Primary Storyline with Connected Clips. If you move something in the Primary Storyline, the connected clips follow. Ripple based editing is the default. If you Delete a clip, the clips to its right ripple left to fill the void. If you move a clip, the clips around it will ripple to close the gap. There are no audio faders. There are no traditional busses. Audio is divided into Audio Components, Roles, and Sub Roles. Mixing can take place on Audio components, Clips, or Roles and Sub Roles at the Compound Clip level. Some find these differences maddening. Others, like Steve Martin, have found ways to work smarter and faster in Final Cut Pro X than in other editing software. Depending on the project, you may opt to do your finishing inside Final Cut Pro X, or pass your Project to another application. For those working inside Final Cut Pro X, there are plenty of built-in tools at your disposal. In version 10.3, there was a complete re-write of its audio pipeline. This allows for audio mastering within the application itself. Version 10.4 introduced new color grading tools. These included color wheels, custom curves, hue/saturation curves, along with new tools for High Dynamic Range grading. These mastering tools are very helpful under tight deadlines. However, how does one work with professional sound designers, mixers, and colorists? That is where turnovers come in. Using FCPXML, you can send your projects to color and audio tools like DaVinci Resolve and ProTools. First, you will want to properly set up your project for a clean turnover. Make sure to output a QuickTime of your project as a reference. Finally, select your Project and export an FCPXML. Your color and audio teams will be at it in no time. How much is Final Cut Pro X? For standard users, Final Cut Pro X is $299.99. Volume licenses are also $299.99 per seat. Educators and Student can get Final Cut Pro X as part of the Pro Apps Bundle for $199.99. This bundle includes Motion 5, Compressor 4, Logic Pro X, and MainStage. Should I switch to Final Cut Pro X? This really depends on your personal preferences. For those already familiar with track based editing, Final Cut Pro X can be maddening. However, it can also make it much easier to assemble and rearrange shots. The best way to find out if Final Cut Pro X is for you is to download the free 30 day trial from Apple. Currently, collaborating with others in Final Cut Pro X takes some extra work. Unlike other editing software, there are no shared bins or bin locking features in FCPX. When connected to shared storage, you can transfer clips, Projects, and Events between Libraries. There are also 3rd party apps like Merge X, PostLab, and KeyFlow Pro that can help enable collaboration. Nobody knows exactly what the future holds. However, the team behind Final Cut Pro X continues to innovate. The last few major releases seem to balance focus between professionals and hobbyists. The number of seats of Final Cut Pro X continue to grow every year. Whether the professionals in Hollywood start using it, the future still seems bright. There are a few things that might affect the future of Final Cut Pro X. In April of 2018, Apple announced their ProRes RAW codec. At launch, only Atomos Recorders and the DJI Inspire 2 drone could capture ProRes RAW. For those wanting to edit ProRes RAW, Final Cut Pro X is currently their only option. Arguably, ProRes RAW could push people to Final Cut Pro X. However, it will first need to be adopted by camera manufacturers as an internally recorded codec. At this writing, ProRes RAW can still only be recorded via the Atomos Shogun Inferno & Sumo 19, or the DJI Inspire 2 drone. Adoption by a camera manufacturer like Arri would be a major turning point for ProRes RAW. Something currently holding Final Cut Pro X back is its lack of collaborative tools. Adobe Premiere Pro CC, Avid Media Composer, and DaVinci Resolve all support some form of bin locking. This allows multiple users to work from the same project at the same time. Final Cut Pro X needs robust collaboration before it can be taken seriously for major motion pictures or episodic television. In the end, feature films and television will not dictate the success of the application. Corporate video teams, commercial editors, wedding videographers, and YouTubers make up a much larger portion of the professional video editing world. Final Cut Pro X continues to innovate in ways that benefit all of these artists. It will be interesting to see what happens with Final Cut Pro X over the next few years.